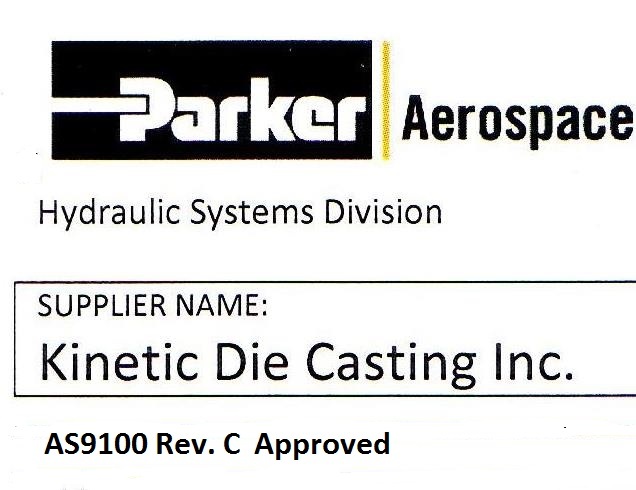 Kinetic Die Casting Company quality is Parker Aerospace AS9100C Approved. Parker is one of several aerospace companies that buy parts from our company. Take a look at the partial list of Aerospace Manufacturing Companies that trust and buy from Kinetic Die Casting Company. Aluminum die casting part sizes from .001 pounds to 10 pounds. Die casting Part sizes range from .025" x .025" to 15" x 15". Surface area on cast parts up to about 200 square inches. 380 Aluminum Die casting Alloy. 383 Aluminum Die casting Alloy. 360 Aluminum Die casting Alloy. 413 Aluminum Die casting Alloy. Die trim or surface grind flash from diecasting parting lines. Drill holes and thread or tap holes in diecasting parts. Mill surfaces in diecasting parts. Vibratory deburr surface finish on diecastings. Aluminum diecasting parts machined to customer specifications. Die castings produced from 100 parts each day (low customer demand). Die castings produced to over 5,000 parts a day (high customer demand). Minimum annual quantity production requirement 500 die casting parts. Maximum annual quantity possible 1,000,000 die casting parts. In-House toolmaker to make new die casting dies (tooling for die casting). In-House toolmaker can retrofit customer supplied die casting inserts inexpensively. In-House toolmaker can make changes to existing die casting dies. Toolmaker can produce trim dies for high production die casting parts. Another advantage to Kinetic Die Casting is our production and quality personnel, who dedicate themselves to producing the best quality die casting parts on time.